Although written primarily for a U.K. audience, I have found Chris Ashworth’s Competitive Advantage blog has real value for marketers and business developers everywhere in the English-speaking world. The recent posting: 7 Reasons Your Construction Project is Not Being Specified, touches close to home, because I spend a fair bit of time with construction specifiers (and business development people working with specifiers) as the chair of the local Construction Specifications Canada chapter. 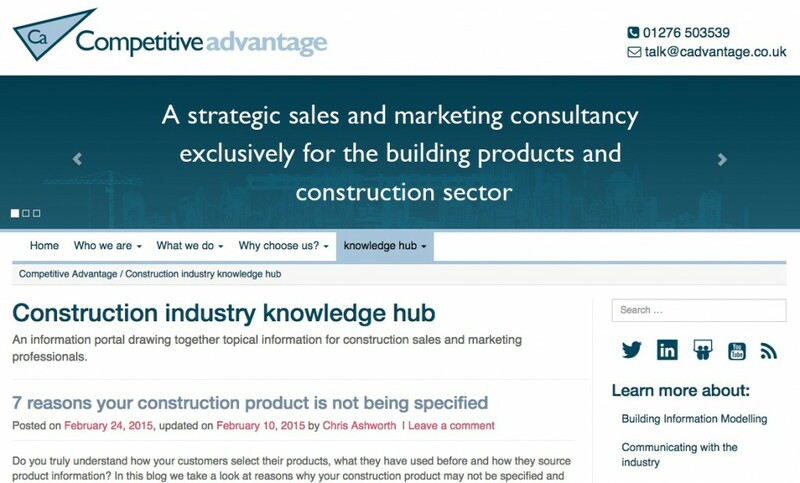 Notably, Ashworth calls his site a construction industry “knowledge hub” rather than a blog — and I think this accurately reflects the high value of the content here. Do you truly understand how your customers select their products, what they have used before and how they source product information? In this blog we take a look at reasons why your construction product may not be specified and suggest ways to improve your specification sales approach. Selling on price alone means you rely on low prices and/or good availability to win orders at the point of purchase. If your product has genuine benefits, which can justify its selection over competitors, then you should be using specification sales to create demand. This way you can move away from selling on price alone and focus on delivering value. For example Clients are increasingly recognising that the cheapest solution at the time of construction may have long term operational cost implications. Consider how your product delivers value, is it ease of installation, low cost of operation, green credentials, aesthetic or functional. Once you have considered what value your product represents develop arguments, using case studies and technical papers, to support the use of your products. Today it is very rare that a single person in construction will have full control of the decision to purchase, and many have the influence to prevent the selection of a product. For an effective specification strategy it is necessary to understand the type of contract being used, to then identify the organisations and decision makers in the project team. This is known as the Decision Making Unit (DMU). The construction sector’s Decision Making Unit (DMU) is far more complex than many business-to-business markets. It is important to spend time understanding the dynamics of the DMU, to identify the key decision makers and influencers of importance to you, this way you can make them aware of your product and ensure they understand the value it can bring to a construction project. Your sales team should avoid just delivering a sales pitch, instead they should be looking to position themselves as Trusted Advisors to the decision makers. To be successful at Specification Sales it is important to be someone the Specifier trusts to provide sound and reliable advice. Your sales team needs to seek to become the Specifier’s design partner, helping solve problems and create quality buildings. So if you are relying on a sales pitch then a change of approach, to that of the Trusted Advisor, will mean the Specifier will be approaching you for advise and guidance. An integral part of becoming a Trusted Adviser is to demonstrate to your customers that you ‘speak their language’. That is you have the technical know-how to understand their challenges and can solve their problems. To achieve this you need to do background research into a customer’s business, read their specialist press, not just those related to construction but the broader issues. This way you can understand what their problems and concerns are, and then think how you can solve them. Your products credentials can provide an important point of differentiation. Sustainability for example, is an opportunity for manufacturers to provide higher performance products and justify premium prices. Already widely used, the BREEAM and Ska rating systems can be expected to become standard tools for building design. If you build these sustainability clauses into your specifications then it will make them more resilient to subsequent substitution, as a result of the “Equivalent” or “Equal” clause. Also consider product availability, manufacturer location, delivery to site, ease of installation, maintenance; All of these aspects should be clearly demonstrated, so to differentiate yourself, demonstrate value and allow you to effectively specification sell. If your organisation has not yet decided to offer BIM content, be aware that in a very short time your business may be disadvantaged. From the manufacturer’s perspective it should be a matter of when to adopt, not if. Our BIM research shows that designers will give preference when selecting products to those available as BIM objects. No change there. It has always been the case that manufacturers who give good technical support will be more successful at creating specifications. To discover more about BIM then take a look at the BIM4M2 website and read the latest research, conducted by Competitive Advantage on behalf of the BIM4M2 group. Or read our blog: Information resources for the manufacturer starting their BIM Journey. You may think you know your customers and their reasons for specification but have you asked them? How many times do you debate customer behaviour, simply to end up in a circular discussion, because you don’t have the factual data to draw conclusions from? Conducting regular construction market research allows insight into the decision making process and the influences on product specification. Reviewing your specification strategy on a regular basis is essential, to ensure you provide the right information at the right time and continue to get your product specified. Conducting research can uncover the facts and lay the foundations for a strong specification strategy. A strategy that allows you to develop a technical team that understands the Specifier’s issues and can propose solutions; with the aim of developing and maintaining relationships with Specifiers– not to sell to them on price alone but to deliver real value. I’ll add another resource that may be helpful, especially if you are in the U.S. or Canada. Construction Specifications Canada (CSC) and (in the US) the Construction Specifications Institute (CSI) offer courses and certification programs for technical reps/marketers as well as specifiers. If you are serious about the process, you may wish to complete these certification programs — and combine these initiatives with participation in relevant specification writing chapters. Regardless, I think CA Competitive Advantage is a truly effective and worthy knowledge hub.